This seems like it could've been a preventable situation. The Oakland Raiders are 0-2 on the season after a heartbreaking loss to the Denver Broncos on Sunday. Oakland had a 12-0 lead at halftime, only to be outscored 20-7 in the second half. Denver kicker Brandon McManus made a 36-yarder in the final seconds to give the Broncos a 20-19 victory. So, that’s not a good start to the (second) Jon Gruden era with the Raiders. The Raiders have many areas they can improve, but one thing Gruden focused on when meeting with the media postgame- the pass rush. 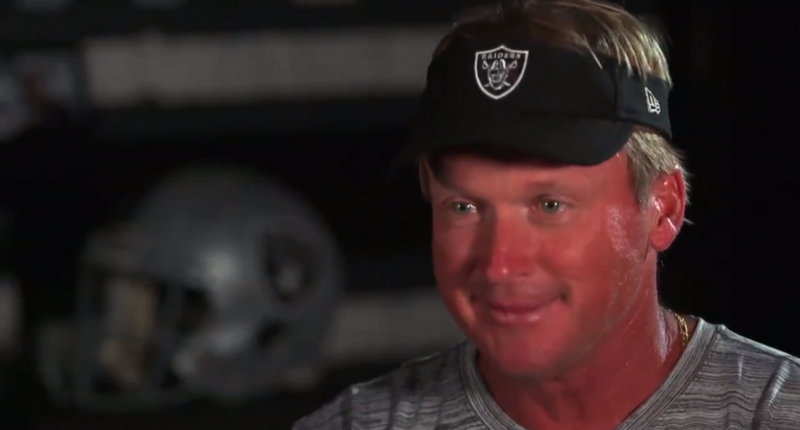 Gruden’s comments come two weeks after the Raiders traded edge rusher Khalil Mack. You know, the 2016 NFL Defensive Player of the Year that is only 27 years old, has 41.5 career sacks already, and had more pressures in Week 1 — his incredible debut with the Chicago Bears — than the Raiders’ entire defense did. The Raiders — 0r more likely *Gruden*, specifically — decided it wasn’t worth paying an elite player at a premium position to keep around (and Gruden is trying to spin it, saying Mack “obviously didn’t want to play” in Oakland). So they gave him to the Bears for two first-round picks (2019 and 2020), a third-round pick (2020) and a sixth-round pick (2019), while also tossing the Bears a second-round pick (2020) and a conditional fifth-round pick. And without Mack, they Raiders having a very difficult time rushing the passer, with only two sacks through two games. Who could’ve seen this coming? You’d think Gruden would at least wait a few more weeks before pointing out the pass rush is a problem, after he took criticism from not just Raiders fans, but pretty much the entire football world for the decision to trade Mack. But here we are.